Australian firefighters are racing to contain a major bushfire before soaring temperatures and high winds fuel the blaze. More than 30 homes are already feared destroyed in the hills behind South Australia’s city of Adelaide. More than 500 firefighters are tackling the fires, which have been burning since January 2. Officials say the blaze is the worst in the area since the Ash Wednesday bushfires in 1983, which left 75 dead. Temperatures are forecast to hit 34C in Adelaide on January 5 before rising to as high as 38C on January 6 and 7, according to Australia’s Bureau of Meteorology. However, the region is not yet out of danger, South Australian Premier Jay Weatherill said. “We’re really racing against time to try to make sure that we get as much of this contained before the hotter weather and the stronger winds are expected later in the week,” he told a press conference. “The objective of this is obviously to ensure that the fire does not spread under the worsening conditions, but also to open up as many areas as possible,” Jay Weatherill said. He said South Australians should prepare for more severe bushfires. A number of towns remained at risk from uncontrolled fire burning in scrub and grass, and some roads into the fire zone remained closed, said the state’s Country Fire Service (CFS). Chief Officer for the CFS, Greg Nettleton, told local media the number one priority for firefighters was to prepare for possible catastrophic weather conditions expected to hit on Wednesday. “The winds will swing around to the north. At the moment I think they’re predicting somewhere like about 35kph [22mph],” said Greg Nettleton. An estimated 12,500 hectares of land have been burnt since January 2, according to local media, and firefighters from South Australia, Victoria and New South Wales are battling the fires’ 150 miles perimeter. Large air tankers are dumping water on the fire front and back-burning operations are underway, where new fires are started in order to burn in the opposite direction to the line of advancing fire. Of the estimated 1100 properties in the Adelaide Hills, 12 are confirmed destroyed with another 20 believed to have been burnt down. Twenty-two people, mostly firefighters, are reported to have suffered minor injuries. 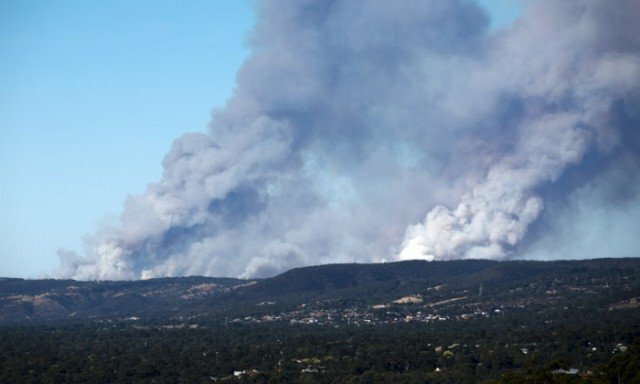 The Insurance Council of Australia has declared the blaze a “catastrophe”, which means insurers can escalate their response, and claims arising from the bushfires should be given priority by insurers.